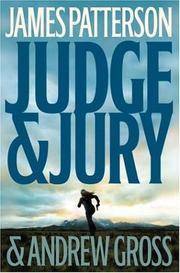 Judge and Jury is a popular novel written by thriller novel writer James Patterson with Andrew Gross. It was published in 2006 by Big Grey &amp; Company. Mainstream Publishing. First UK edition-first impression. Hardcover. Very good/Very good. Signed by the Author. VGC plus.Mainstream Publishing,1994.First UK edition-first impression.The book is Signed by the Author on the title page with a small inscription.Black hardback(gilt lettering to the spine) with Dj(two small creases and nicks on the edges of the Dj cover),both in VGC plus.Nice and clean pages with light shelf wear on the outer edges,a couple of small creases on the edges of the pages,small pencil mark impression on the edge of the front endpaper.Nice and clean book with light shelf wear on the Dj cover.319pp.Price un-clipped.A collectable signed first edition.Heavy book. Warner Vision Books. Mass Market Paperback. 0446619000 Please allow 4 - 14 business days for Standard shipping, within the US. Thank you for supporting our small, family-owned business! . New. 2007-03-01. Cover Worn. Warner Vision Books. Mass Market Paperback. 0446619000 Please allow 4 - 14 business days for Standard shipping, within the US. Thank you for supporting our small, family-owned business! . Fine. 2007-03-01. Cover Worn. Little, Brown & Co/Doubleday. Used - Good. Good condition. Good dust jacket. Large Print edition. Little, Brown And Company. Hardcover. 0755330471 New Condition. . New. Warner Vision Books. MASS MARKET PAPERBACK. 0446619000 New Condition. . New. Headline Book Publishing. PAPERBACK. 0755330498 New Condition. . New. Little, Brown and Company. Hardcover. 0316015830 New Condition. . New. Headline. PAPERBACK. 0755349539 New Condition. . New. Headline Book Publishing. PAPERBACK. 0446698148 New Condition. . New. Little, Brown and Company. Hardcover. 0316013935 New Condition. . New. Little, Brown And Company. Hardcover. 0755330471 New Condition *** Right Off the Shelf | Ships within 2 Business Days ~~~ Customer Service Is Our Top Priority! - Thank you for LOOKING :-) . New. Warner Vision Books, 2007-03-01. Paperback. Used:Good. Little, Brown and Company, 2006-07-31. Hardcover. Used:Good. Warner Vision Books, 2007-03-01. Mass Market Paperback. New. Little, Brown and Company. Hardcover. 0316013935 Special order direct from the distributor . New. Little, Brown and Company. Hardcover. 0316013935 New Condition *** Right Off the Shelf | Ships within 2 Business Days ~~~ Customer Service Is Our Top Priority! - Thank you for LOOKING :-) . New. New York: Little, Brown, 2006. Book. Fine. Hardcover. Signed by Author(s). AN OUTSTANDING COPY - SIGNED by ANDREW GROSS on the Title page. Author's Signature only. A First edition, First printing, with the corresponding number line. Book is in Fine condition. Boards are clean, not bumped. Fore edges are clean. Interior is clean and legible. Not remaindered. Dust Jacket is in Fine condition. Not chipped or crinkled. Not price clipped. Dust Jacket is covered by Mylar Brodart. Thanks and Enjoy..
Hachette Audio, July 2006. Audio CD . 3 PB standard 50%. Headline. PAPERBACK. 0755349539 Like New Condition. . Fine. Little, Brown And Company. Hardcover. 0755330471 Like New Condition. . Fine. Little, Brown and Company. Hardcover. 0316013935 Like New Condition. . Fine. Headline Book Publishing. PAPERBACK. 0755330498 Like New Condition. . Fine. Headline Book Publishing. PAPERBACK. 0446698148 Like New Condition. . Fine. Little, Brown and Company. Hardcover. 0316015830 Like New Condition. . Fine. Warner Vision Books. MASS MARKET PAPERBACK. 0446619000 Like New Condition. . Fine. Little, Brown And Company. Hardcover. 0755330471 Please allow 4 - 14 business days for Standard shipping, within the US. Thank you for supporting our small, family-owned business! . Fine. 2006-01-01. Little, Brown And Company. Hardcover. 0755330471 Please allow 4 - 14 business days for Standard shipping, within the US. Thank you for supporting our small, family-owned business! . New. 2006-01-01. Little, Brown and Company. Hardcover. 0316013935 Please allow 4 - 14 business days for Standard shipping, within the US. Thank you for supporting our small, family-owned business! . New. 2006-07-31. Little, Brown and Company. Hardcover. 0316013935 Please allow 4 - 14 business days for Standard shipping, within the US. Thank you for supporting our small, family-owned business! . Fair. 2006-07-31. Little, Brown and Company. Hardcover. 0316013935 Please allow 4 - 14 business days for Standard shipping, within the US. Thank you for supporting our small, family-owned business! . Fine. 2006-07-31. Little, Brown and Company. Hardcover. 0316013935 *LIKE NEW* Ships Same Day or Next! . Fine. Little, Brown and Company. Hardcover. 0316013935 *BRAND NEW* Ships Same Day or Next! . New. Headline Publishing. First edition-first printing. Hardcover. As New/As New. Mint condition.Headline Book,2006.First edition-first printing.Black hardback(silver lettering to the spine) with Dj(small crease on the edge of the Dj cover),both in mint condition.The book is new.341pp.Price un-clipped.First edition. Little, Brown And Company. Hardcover. 0755330471 Please allow 4 - 14 business days for Standard shipping, within the US. Thank you for supporting our small, family-owned business! . Fair. 2006-01-01. Warner Vision Books. Mass Market Paperback. 0446619000 Please allow 4 - 14 business days for Standard shipping, within the US. Thank you for supporting our small, family-owned business! . Fair. 2007-03-01. Cover Worn. Little Brown Publishers, 2006. N/A. Hardcover. Like New/Like New. Headline Book Publishing. PAPERBACK. B002Q31ENQ Very Good Condition. Tight and Neat. Five star seller - Buy with confidence! . Very Good. Little, Brown and Company. Hardcover. 0316013935 1st edition 1st printing - signed by Patterson on title page - minor staining to page edge - minor note inside back cover - otherwise dust jacket and cover fine binding strong contents clean - enjoy . Very Good. NEW YORK: LITTLE, BROWN AND COMPANY. VG/VG. Pages: 421. . 2006. 1ST. HARDCOVER..